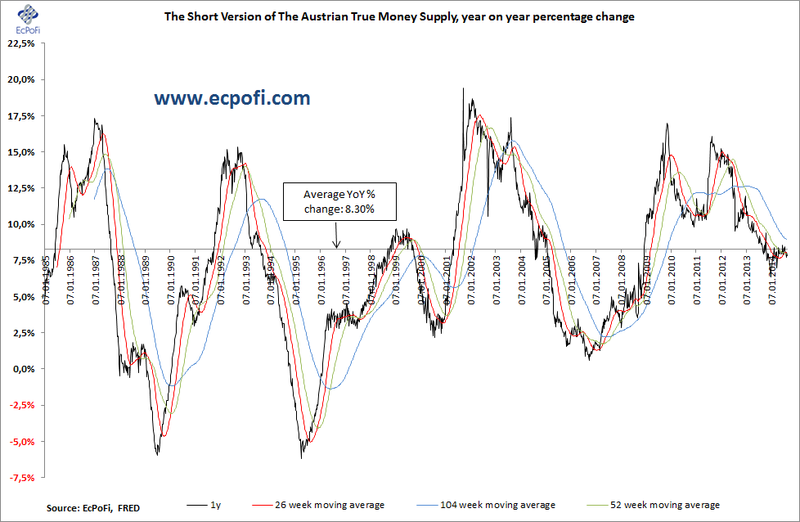 The short version of the Austrian True Money SupplyÂ for the U.S., a measure of the money supply applied in this weekly report,Â decreased 0.55% on last week for the week ending 25Â August 2014. At $10.1824 trillion,Â the money supply is now up 3.07% year to date. The 1-year growth rate dropped to 7.85%, down from 8.06% reported last week. It remains lower than the 8.30% long term average since 1980. The 5-year annualised growth rate continues to fall. The current growth rate of 10.54% remains well above the long term average of 7.54%, but is much lower than the 12.40% recorded in October last year. The current growth rate is also 1.34 percentage point lower than it was during the same week last year and this week was the 39th week in a row with a declining growth rate on this basis (see the dotted line in the chart below). As I’ve mentioned on quite a few occasions before, the drop in the 5-year growth rate (both the year on year growth rate and the percentage point change in the growth rate) has for some time resembled the decline leading up to the 2008 banking crisis (as indicated by the circles in the chart above). To highlight this resemblance, the chart below depicts the percentage point change in the growth rate compared to last year for the periods 24 December 2001 to 11 September 2006 and 1 August onward. The chart not only demonstrates the resemblance between the percentage point change during the two periods, it also shows that this time around the growth rate is declining faster than it did during the 2001 to 2006 period. Even if the rate of growth continues to decline, the U.S. economy might still avoid some kind of a crisis for many more months if the 2001-2006 period is any guide to the future. If the results of our theoretical analysis were to be subjected to statistical investigation, it is not the connection between changes in the volume of bank credit and movements in the price level which would have to be explored. Investigation would have to start on the one hand from alterations in the rate of increase and decrease in the volume and turnover of bank deposits and, on the other, from the extent of production in those industries which as a rule expand excessively as a result of credit injection. 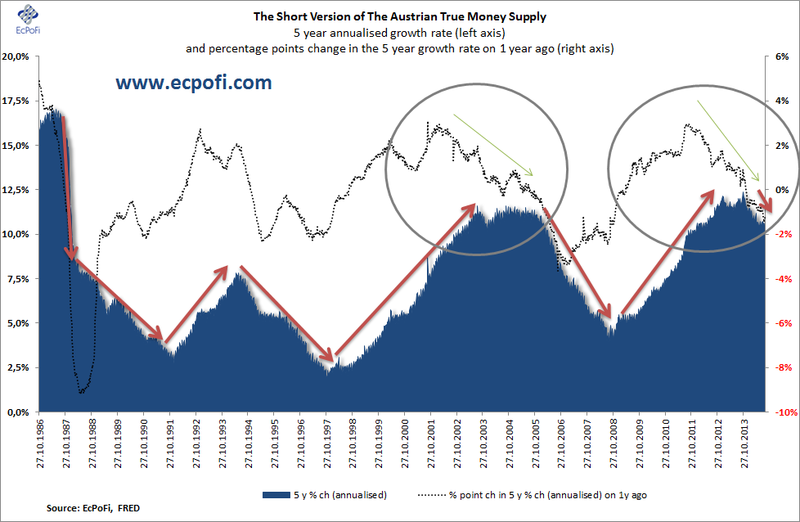 Every increase in the circulating media [money supply] brings about the same effect, so long as eachÂ stands in the same proportionÂ to the existing volume; and only an increase in this proportion makes possible a further increase in investment activity. On the other hand, every diminution of theÂ rate of increaseÂ in itself causes some portion of existing investment, made possible through credit creation, to become unprofitable. 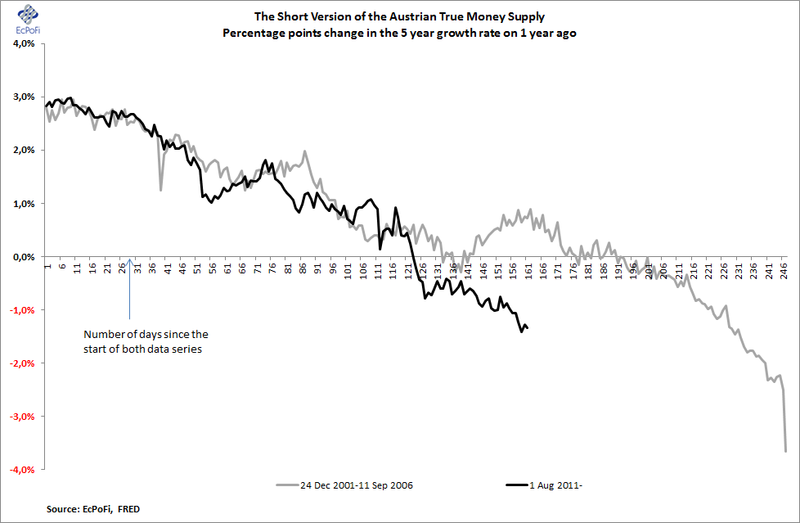 Hayek’s theories and those of the Austrian Business Cycle Theory (ABCT) in general are the reasons why this weekly report looks at the growth rate of the money supply on a weekly basis, including the rate of change. 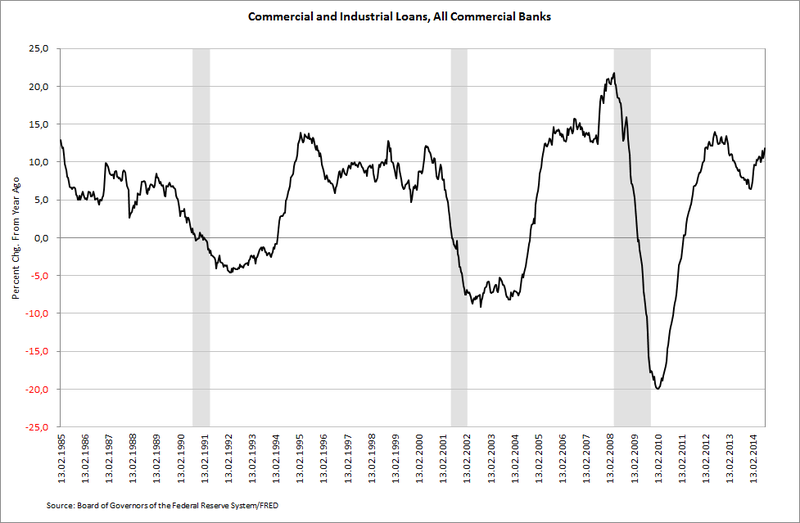 However, bank lending this year has shot upwards once again and, as I’ve written earlier, the U.S. economy is once again entering the situation the ABCT attempts to explain; an increase in credit unbacked by a commensurate amount of prior savings granted to businesses (e.g.Â here).